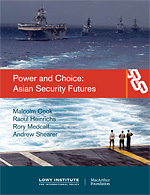 This paper sets the foundation for the Lowy Institute’s MacArthur Asia Security Project. It outlines four regional security futures, the strategic dynamics and political choices that could give rise to each of them, and their implications for the region’s security architecture. It then examines four plausible ‘shocks’ – strategic events which might dramatically tip the region’s future in one direction or another – and concludes with a discussion of the need for realistic confidence-building measures to help mitigate the most serious risks of disruptive change. Asia is in flux owing to the region’s changing distribution of power. However, as the region’s longstanding security order potentially gives way in the coming years and decades, the kind of arrangements that are likely to emerge in its place remain unknown, and to some extent unknowable. At the same time, the shift of world economic and strategic weight to Asia means that the global strategic order will be increasingly shaped in Asia by Asian powers. The strategic future of Asia has never mattered more to the world – yet nor has it ever been less clear. This paper sets the foundation for the Lowy Institute’s Asia Security Project, part of the MacArthur Foundation Asia Security Initiative. It outlines four regional security futures, the strategic dynamics and political choices that could give rise to each of them, and their implications for the region’s bilateral and multilateral security architecture. It then examines four plausible ‘shocks’ – strategic events which might dramatically tip the region’s future in one direction or another – and concludes with a discussion of the need for realistic confidence-building measures to help mitigate the most serious risks of disruptive change. The paper’s approach is based on the assumption that power distributions determine strategic orders, which in turn shape the region’s structures, processes and institutions.